Enjoy a 1-for-1 movie treat on us every Sunday. to get the second ticket FREE. M1 customers are required to present their latest M1 bill or show the M1 logo on their phone at Cathay Cineplexes' Box Offices when purchasing movie tickets to get the second ticket FREE. Redemption at Cathay Cineplex Cineleisure Orchard and The Cathay Cineplex will be conducted at the Level 5 box office only. Offer is valid for the first 350 M1 customers across all locations from the first showtime every Sunday. Upon redemption, M1 customers are required to provide their name, NRIC and mobile numbers to Cathay staff for verification purposes. Offer is not valid for phone, online bookings, 3D, Film Festival, Tamil and Hindi movie titles. 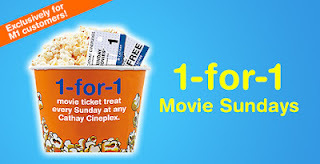 Offer is limited to one free movie ticket per customer per day. Offer is not valid with other discounts and promotions at Cathay Cineplexes.